Zizipho Ndlwana, an Assistant Researcher in the Sport Management Department, beat the odds by recently climbing the highest peak of Mount Kilimanjaro despite being an amputee. At 5 895m above sea level Tanzania’s Mount Kilimanjaro is the highest mountain in Africa. 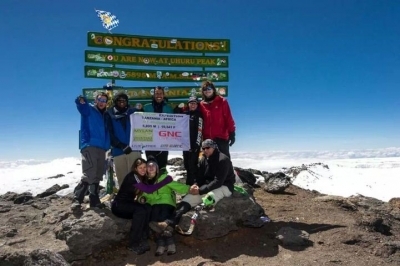 It took Ndlwana’s group, which included three other amputees from Cape Town, Johannesburg and America, eight days to climb up and down the summit. “It was the most challenging thing, psychologically and physically, for an amputee to do. It was energy consuming and we endured a lot of pain,” he says. He says in spite of the challenges he drew strength to keep going from his teammates’ determination to complete the climb as well as their smiles. They embarked on the journey to spread a message of hope to the world as well as raising funds for the Gabriella Centre, a Somerset-West based home for people with Cerebral Palsy. After the hike they visited a Tanzanian school for disabled children where they gave a motivational talk to the staff and learners. “I feel blessed now that I have done the hike,” says Ndlwana. In 2010 Ndlwana was involved in a car accident which caused his left leg to be amputated as his body sustained multiple fractures. He started his rehabilitation in 2011 and eventually got to walk again, something he thought he would never be able to do. He is currently preparing for the qualifiers for the next Paralympic Games where he hopes to compete in discus and shot put.